Sorry for the delay on this week's Community News! I've been away and trying to do a lot of catch-up, but here is the last round of Community News for 2013. Thanks for a great year, Jersey City! Congratulations to Incrediballs who made #12 on the Best Jersey Eats list from Munchmobile overseer Peter Genovese! Union Republic is carrying a full line of vegan and paleo-friendly yogurt from Anita's Coconut Cultured Cream and they've also started up their grab-n-go options. For December, they're offering: a whole wheat chicken salad wrap, a braised kale salad with cranberries and gouda, and a vegan quinoa salad with dried cranberries, caramelized walnuts, and green onions. Hudson Restaurant Week is coming up again! It runs from Jan. 13th - Jan. 26th with some restaurants offering a second week of great deals. Keep an eye on the website for participating restaurants, news, and information! Vu Restaurant at the Jersey City Hyatt is open Christmas Eve and Christmas Day for all your holiday (or non-holiday) dining needs. Casa Dante will be having their annual Seven Fish Christmas Dinner with six courses for $79/person as well as serving their usual extensive a la carte menu on Christmas Eve. Celebrate New Years Eve With Your Jersey City Favorites! This New Years, come celebrate along with Jersey City at one (or many) of the awesome events happening around town! There will be drinks, music, people...everything you need to ring in 2014 and get your New Year started right. In addition to the events listed at the jump in the original post, here are some more optioons so you can celebrate in style! Tickets and reservations are still available for most places and many are walk-in friendly as well. Happy New Year everyone! 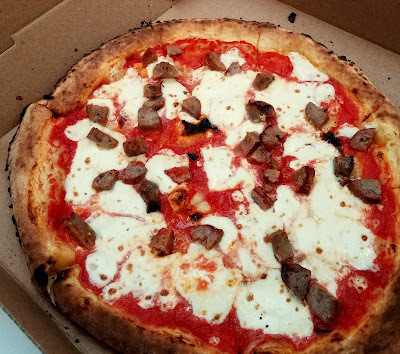 If you're still looking for unique and awesome gifts (and you're not alone in that), why not consider some of the awesome food/beverage options around Jersey City? Word Bookstore in Jersey City opened up this weekend! The bookstore is up and running and they're anticipating having the cafe open sometime this week: http://wordbookstores.tumblr.com/post/69891347456/word-jersey-citys-bookstore-soft-opening-is Can't wait! Casa Dante will be running a buy one drink, get one half off happy hour Monday through Thursday from 4:30-6:30pm all through the holiday season so stop by for some festivity! Speaking of ModCup, they also announced that Travis will be in the UK for the next week, so if you have any coffee needs, email or DM ModCup for Justin's number. Talk about personalized service! Hope everyone made it through the snowstorm yesterday and kept warm! A few days ago,Razza announced via twitter that they were bringing back their roasted pumpkin pizza, complete with a mouth-watering picture. Having somehow missed this on the first go-around and having an already proven love for Razza, I knew I didn't want to miss this opportunity again. However this time around, I found myself with not a lot of time and too many things to do, so instead of missing my chance, I decided to just order take-out which was my first time doing so. I love the dining experience at Razza....but it's really nice to have this option as well. Along with the roasted pumpkin pizza which was listed on their everyday menu, I got their Kale Caesar Salad which is always delicious and remains one of the best kale salads I've ever had. 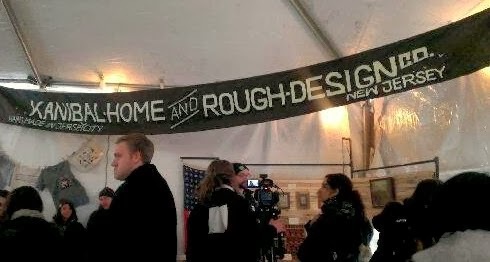 Yesterday was the much anticipated Holiday Market presented by the Jersey City Project and Yelp and Jersey City turned out in full force for the occasion! There were tons of people, lots of great stands and creative gift items around and of course, some delicious food. The variety and creativity on display was astounding with everything from imprinted goods from Nightingale Project to soaps and cars from Smith and Chang while Kanibal Home brought out some beautiful antique jewelry. Today was the end of 6th Borough Market's 2013 Season and what a great season it was! Can't wait to see more in 2014. 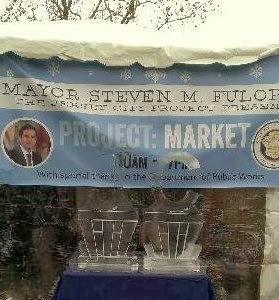 Today was also the Jersey City Project's first venture, the Holiday Market and it was a huge success! Looking forward to what comes next! 9th and Coles is getting into the holiday spirit! If you bring in an ornament for the 9C tree and give it to the bartender, you'll receive a free glass of wine or mixed well drink - 1 per customer please. Skinner's Loft is having their Christmas party tomorrow, so stop by and enjoy live music, caroling, food and drink! JC Heights Holiday Market on Saturday! This Saturday, December 7th, join Farms in the Heights and the Riverview Neighborhood Association in celebrating the holidays with the Jersey City Heights Holiday Market from 11am-5pm! ﻿Held at the Elks Club, the market will feature a wide variety of local vendors with music, food, and crafts for kids! As most of you probably know by now, there was a major fire on Grove Street last Wednesday, Nov. 27th that demolished two buildings and caused damage to several others. A total of 22 residents have been displaced and several businesses were affected including Buon Appetito and Orale. This is a huge and devastating loss but people and business owners all over Jersey City are banding together to help out. Currently, United Way of Hudson County is handling all the donations and is the main point of contact for helping the victims. You can donate $10 by texting 5200 with the subject Fire to donate to the victims and they are waiving all fees so 100% of your donations with go to help the victims of the fire. Additionally, Port-O Lounge held a fundraiser yesterday and Thirty Acres donated all their profits from Saturday's dinner service to help. There are several more fundraisers planned around Jersey City if you'd like to help. The Thirsty Quaker, a new homebrew supply store, will be opening sometime over the next couple of weeks at 492 Monmouth near Hamilton Park. Besides homebrew supplies, they will also be selling various alcohols, filling up growlers and hopefully hosting classes. It sounds like a great addition to Jersey City.